I watched the Olympics on a small black and white television when I was a young child in the fifties. Like a lot of things—cars, music, telephones—television coverage of the Olympics was different then. We would watch contestants competing in real time. And the networks showed all the athletes, not just the Americans. The slick packaging of sports as a form of entertainment hadn’t ascended to an Olympian level back then. The close-ups were limited, the interviews rare, and the camera angles not always the most dramatic. But the sense of watching something unique lent the event a glamor unmatched by today’s technically superior coverage. When I was child I was given to understand that what made Olympic athletes different from other athletes was that Olympians came from all walks of life, that they were just regular humans who worked hard in their spare time to achieve athletic greatness for the honor of their country. There’s still an element of that beneath the massive marketing and the publicity circus that both sustains and feeds off the modern Olympics. But more often it seems that the athletes who climb their way onto the podium are nothing at all like ordinary mortals. Most of them devote years to develop the skills and strength and mental fortitude essential to compete at the highest level. Perhaps this is how the Olympics were always meant to be. Perhaps my childish notion of an Olympic competition as a bloodless pageant that could, ideally, foster peace and understanding between all the nations of the world was as naive as many of my ideas at that age. But even now, when I watch the Olympics, marveling at the unparalleled daring and skill and grace of the competitors, that same naive hope still burns bright as any Olympic torch. In the Sochi Olympics I’ve been mesmerized in particular by the ice dancing. For many years I never paid much attention to the ice skaters. I could skate. Big deal. Then I saw Charlie White and Meryl Davis skate together, and I realized that what I did wasn’t even the equivalent of crawling compared to the athletes who dance on ice and make it look easy. White and Davis, who have been skating together for seventeen years, met as eight-year-olds in Michigan. Last night they won the gold medal in ice dancing for the United States, the first time an American team has won the gold since the sport was accepted into the Olympics in 1976. While many Olympic events seem focused on driving athletes to go faster, higher, and farther, not many require the synthesis of artistry, passion, and teamwork that make ice dancing so thrilling. Sure, there are always a few people who don’t get it. Some people seem suspicious of any sport that doesn’t involve grunting. It took seventeen years, but White and Davis did the impossible last night. On Russian soil they performed with flawless brilliance. Some may flap flags and feel proud to American, and that’s part of it. But for me, their performance makes me feel hopeful for humanity. 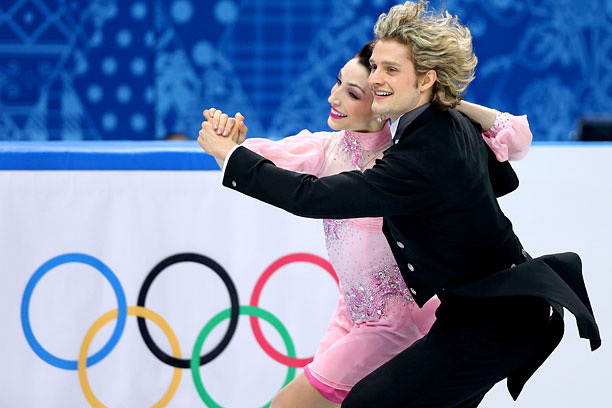 If our crazy self-destructive species can still turn out a pair of kids like Charlie White and Meryl Davis, then maybe there’s hope for us yet.